Evan Brown, 33, of Brooklyn, New York. Philadelphia police announced charges Tuesday against a Brooklyn man they say spray-painted the words "F--- Trump" on the facade of a Chestnut Hill supermarket late last month. Authorities arrested 33-year-old Evan Brown for his alleged involvement in vandalizing the Fresh Market at 8200 Germantown Ave. 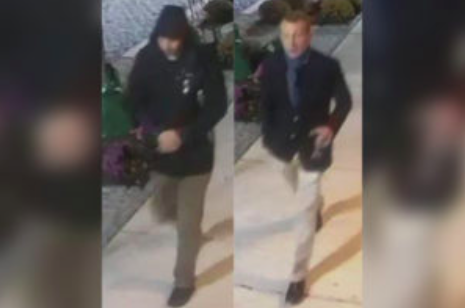 The Nov. 25 incident gained widespread publicity after surveillance video allegedly showed 32-year-old assistant city solicitor Duncan Lloyd and Brown taking pictures of the message. The men in this surveillance photo have been identified as Evan Brown, left, and Duncan Lloyd, right. Philadelphia police announced Tuesday that Brown is charged with spray painting the words “F--- Trump” on the wall of a Chestnut Hill supermarket. Lloyd is not facing any charges. Lloyd is not charged with any crimes and reportedly will keep his job with the city in the wake of the incident, a decision that has angered the local Republican party. 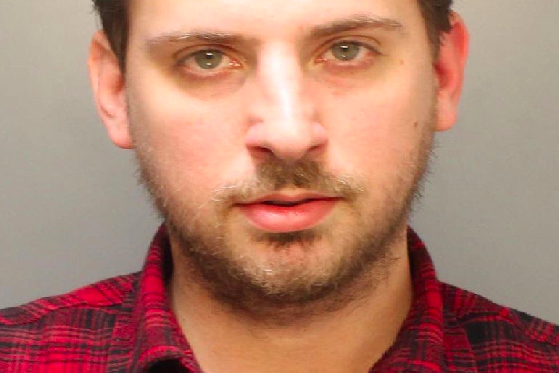 "For somebody with extensive legal training to feel entitled to vandalize a newly opened supermarket strikes us at the Philadelphia Republican Party as an astonishing feat of idiocy," Chairman Joe DeFelice said in a statement. "The taxpayers should be entrusting exactly none of our faith into this man." At least one local editorial suggests Philadelphia "royally" botched the case by letting an attorney like Lloyd off the hook. Brown is charged with criminal mischief and related offenses. Fresh Market has estimated it will cost between $3,000 and $10,000 to repair the damages due to the composition of the stone used in the construction of the facade. The incident was one of several local acts of vandalism that followed in the wake of the Nov. 8 presidential election.